We LOVE dogs, and their health, comfort and safety is our absolute #1 concern. Everything else is secondary. 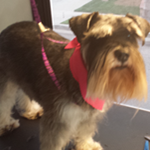 We would rather your dog leave our truck happy with a cute but imperfect hair cut than miserable with a perfect coif. Given this, we have developed a list of safety-related policies. Please review them and let us know if you have any question or concerns! If your pet becomes ill or is hurt during the grooming process and you cannot be immediately reached, you authorize us to obtain emergency veterinary care at your expense. You will inform us if your pet has aggressive tendencies or if he or she has a history of biting. Owners will be liable for injury to the groomer or to groomer’s property caused by their pets. If your dog is showing signs of aggression during the grooming process, we will stop the process and you will be responsible for the full cost of the grooming visit. We understand that not all pets will behave like perfect angels during an entire groom, but for the benefit of all involved we cannot provide services for vicious or aggressive dogs. 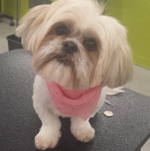 Though we take every effort to make the grooming process a pleasant and relaxing one for your beloved dog, it can sometimes be stressful, particularly for senior pets or pets with health problems. It can also expose hidden medical conditions or aggravate existing ones, during and after the grooming. Because senior pets and pets with health problems have a greater chance of injury, these pets will be groomed for cleanliness and comfort, in styles that will not add to their stress. 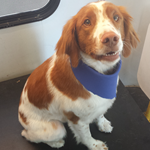 Our goal will be to make your pet more clean and comfortable with the least amount of stress. Must Love Dogs Mobile Grooming will not be responsible for accident, illness or injury to an elderly or health-compromised pet during their grooming. Please consult with your vet if your pet has special issues or if you have any concerns about whether you dog should be groomed. You and your vet know your dog best! Err on the side of caution and if your dog is not feeling well, please forgo grooming for a time. We will not perform excessive dematting, but rather will recommend that dogs with severe matting be shaved down and the matted coat removed. Excessive dematting can be uncomfortable and even painful for your pet. Since our goal is a safe, pleasant, and low-stress experience for your pet, we do not want him or her to endure a lengthy dematting procedure. However, removing a heavily matted coat includes risks of nicks, cuts, or abrasions due to warts, moles or skin folds trapped in the mats. Heavy matting can also trap moisture near the pet’s skin allowing mold, fungus or bacteria to grow, causing skin irritations that exist prior to the grooming process. After effects of mat removal procedures can include itchiness, skin redness, self-inflicted irritations, or abrasions and failure of hair to regrow. Shaved pets are also prone to sunburn and should either have sun screen applied daily or should be kept out of the sun until the hair grows sufficiently to protect the skin. In some cases pets may also exhibit brief behavioral changes. As the owner, you are responsible for the condition of your pet’s coat and may not hold Must Love Dogs Mobile Grooming responsible in the event of adverse effects of mat removal. 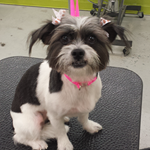 Prevention is the best defense against matting by scheduling regular grooming sessions. Shaving a heavily coated or undercoated dog is not recommended. These coats may grow back patchy or uneven. We require your pet to have an up-to-date Rabies Vaccination prior to service as required by California law. Some pets are very sensitive to certain grooming procedures (the most common being nail trims, teeth brushings and ear cleanings). Although these procedures are performed for the well-being of the pet, we will not continue with any procedure that causes pain, discomfort, risk of injury, or distress to the pet. Sometimes these procedures are best left to the care of a veterinarian. Although we use extreme caution and care in all situations, grooming equipment is sharp, and pets can wiggle or move at inopportune moments resulting in possible accidents. Your pet’s safety and comfort is our number one priority. In the event an accident does occur, you will be notified as soon as possible. If we feel it is serious, and the owner is not on-site or cannot be contacted immediately, we will attempt to seek medical treatment for your pet. 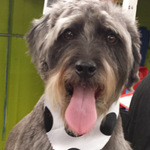 Reimbursement for such care will be at the sole discretion of Must Love Dogs Mobile Grooming. We will arrive as close to our scheduled appointment time as possible; however, we will not jeopardize the safety or comfort of any client to save from being late to the next appointment. Because of this, we will provide you with an approximate time frame for our appointment and will contact you by phone or text if we must be late.